The Varsity Boys Basketball team started this season strong with a win over Hartford, then followed it up with an exciting win over Spaulding, their Division 1 rivals. It was an excellent start to the season, as the Raiders lost three key players from last season but still got off on the right foot. 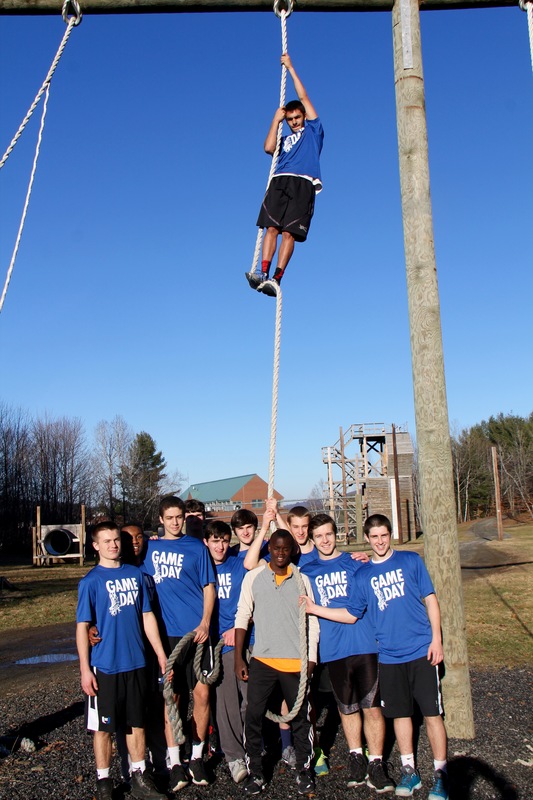 U-32’s Jacob Toro holds onto a rope above his teammates after a day of team-building with the Army ROTC at Norwich University. Last year’s point guard Kyle Graves left for Montpelier, center Jordan Moore is now at Twinfield, and forward Gus Obeldobel isn’t playing, but U-32 has looked strong so far. They’re averaging 72 points per game, and are coming off of an 84-point game against Spaulding. Depth is definitely a big strength for the Raiders this season. Jackson McCoy is averaging a double-double (20 points and 10.5 rebounds per game), but what makes U-32 even better is the scoring behind him. Kyle Booth is averaging 15.5 points, and has filled the stat sheet with five rebounds, three steals and two blocks a game. Hayden Roberge (10 ppg) and Dashiell Vermilya (3 assists per game) are both key contributors as well. So far, they’ve outrebounded both opponents they’ve played, despite lacking any size down low. This could be a problem later in the year when facing teams with larger sized players, but for now, U-32’s been able to out-hustle both team’s they’ve faced. Still, U-32’s fast-paced offense is loaded with dangerous three-point shooters. They’re averaging almost 23 attempts a game, and are hitting seven. Jacob Toro, who’s averaging 5.5 points per game (40%), while Roberge (43%) and Quintin Pelzel (60%) are both good shooters. “When we are all clicking and playing together that is when we play the best basketball we can,” McCoy added. Overall, the Raiders have a lot of potential this season. With a deep lineup and dangerous shooting, U-32 is in position to make a run to the Barre Auditorium after a first round knockout last season.